The i420/i430 voltage input pins attach directly to Max470x IC's on the i4xx printed circuit board, near the Hd44 Connector. These are 16pin devices that are approximately 1 x 2 cm in size. They can only withstand so much electrical abuse, as noted by their datasheet. Abuse comes primarily in two forms. One is static electricity. Too much and the IC will blow. Do you sometimes feel a shock when you touch something in the vicinity of the instruNet hardware? If so, static electricity might be an issue. Another form of abuse is exceeding the maximum voltage specifications. One should not apply greater than 25V or less than -25V to an i420/i430 voltage input pin, relative to instruNet ground ("GND" terminal), with instruNet power on or off. 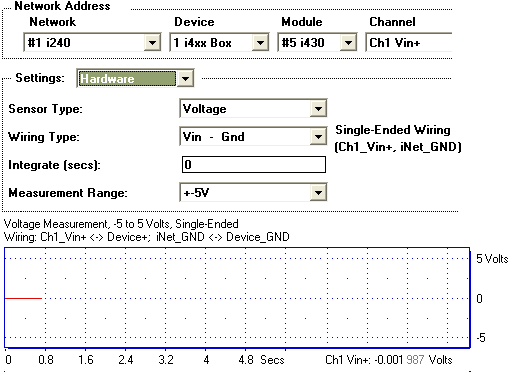 Are you working with higher voltages in the vicinity of your sensors? If so, a wiring error could cause an IC to blow. Also, if one attaches connectors while power is on, for just a moment, then the wrong pin could attach to the wrong place and cause damage. Therefore, attaching cables with power off is strongly recommended. There are two ways to fix an IC. One is to return hardware to your instruNet supplier for repair; which involves time and cost. Another is to fix in one's laboratory by de-soldering the blown IC and installing a new IC. These IC's are available from www.digikey.com; which ships directly to the USA, Europe, Asia and China. To buy from digikey, please click on Max4709ese (i420) or Max4708ese (i430). For videos on rework, please see: IC Removal and IC Soldering.